Sevendust have performed 462 shows over a 21 month span, spending their first few months on the road in a van, graduating to an RV, and not relocating to their first tour bus until their second year of touring. Show No. 462 was followed by a much-deserved three week break, which immediately segued into three months of writing, two months of recording, two more weeks off, a week of rehearsal, then a return to the road for a recently completed run as a headliner of the Vans Warped Tour. Did we mention their prime billing at Woodstock ‘99? Now, with the August 24 release of sophomore effort Home and their current tour with support acts Powerman 5000, Staind and Skunk Anansie, they’re ready to start the cycle all over again. Yes, the Atlanta quintet have come a long way since appearing on the cover of Maximum Ink back in April ‘97. It was then, little more than two years ago, that hard rock and heavy metal were struggling to regain a foothold in a scene ruled by alterna-rock radio. But times have changed. Case in point, Madison’s 94.1. WJJO made the conversion to a hard rock format just as Sevendust entered the scene. It’s clear that they’ve helped each other with the success both have achieved. But they have, and barring even the cruelest treatment from the Gods of metal, Home is poised to take Sevendust even higher. 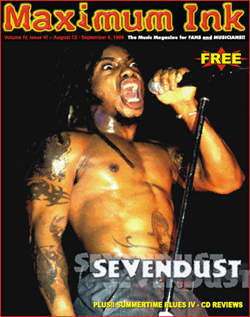 As pummeling as their self-titled debut may have been, it’s follow-up is Sevendust shining their full-metal racket to a lustrous sheen, frontman Lajon Witherspoon punching through the dual guitar attack of John Connolly and Clint Lowery with vocals that tremble with soul, then terrify at their most brutal heights. Highlights include “Headtrip,” humming like an 18-wheeler careening down an interstate, “Waffle” whipping around Connolly and Lowery as Witherspoon belts through bassist Vince Hornsby’s bending strings, and “Rumble Fish” accelerating into a maddened frenzy. An appearance by Skunk Anansie frontwoman Skin turns “Licking Cream” into a haunting voyage led by two of the genres best voices, while Deftones frontman Chino Moreno helps transform “Bender” into an album-ending vocal onslaught. They never intended to write a concept album, but Home is just that, focusing on the realities of life on the road, the band’s tumultuous two years of excess and recklessness, and their place in metal as the genre prepares for the new millennium.